So I wasn’t kidding when I mentioned I’m into Dragon’s Dogma. I’m at that particular stage of video game obsession where when I’m not playing it, I’m thinking of playing it. A related obsession has sprung up for me, though, and that’s the obsession of posting screenshots. You can take and upload screenshots directly from the game. This is not such a big thing for computer players, but trust me when I say this feature is fairly novel for this generation of video game consoles. See for yourself how much I’m uploading to the official video game website (the answer is several pics everyday). It’s fun to document your fictional adventures and put them up for strangers to view. It’s fun even when no one sees your pics, but it’s even better when random people on the Internet actually compliment you on them. I did notice, however, that the majority of the screenshots posted are from Japanese players. Not only that, but the uploaders often write a short blurb to which other players respond. I can’t read Japanese but it’s obvious that there’s a community of Japanese players carrying on conversations and connecting with each other through their enjoyment of the game. However, there is no similar community of English speaking players on the game website. There are anglophone players, but compared to the number and visibility of the Japanese players they’re a drop in the bucket. It’s not as if the narcissism of the screenshot is unknown outside of Japan. Do I even need to mention that the word “selfie” exists? I would theorize that the dominance of Japanese players is due to a couple of reasons. The first is that the Japanese Internet is more centralized than that of other linguistic communities. A gigantic amount of Internet traffic in Japan goes through one website, 2ch. It’s my understanding that it’s basically an old school BBS with a few modifications and apparently still has that terrible web design from the 1990s that oldsters might remember. Even if they’re not on it, a Japanese Internet user will at least have heard of the site. No equivalent website exists for the English Internet. Players would be on several different message boards, blogs, and gaming sites, so one single service would not dominate. 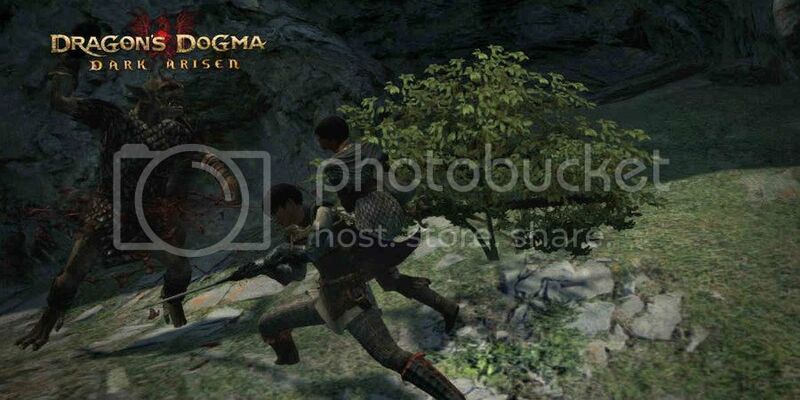 Of course, the Dragon’s Dogma site is integrated directly into the game, so players should at least be discovering it that way. Thus, the second reason I would say that so few English speakers can be found on the game site is due to is popularity – namely, its popularity with Japanese players. An English-speaking player might share a few screenshots and go to the game site hoping for some discussion, then discover that most of the existing conversation is in another language. They might make a few attempts at connecting with other English-speaking players, and a few die hards might stick around, but the majority will retreat to their own gaming forums or even just give up on connecting at all. There might be all this rhetoric about the Internet allowing one to connect with a yak herder in Nepal, but in truth the Internet is a very segregated place. Users talk mostly to people in their own country. This does make sense, after all – how many Korean TV shows are shown in the USA, for example? Who else would Korean fans talk about their favourite TV show with but with other Koreans? Of course, there are languages with international reach and emigrant diasporas, so there’s still a bit of internationalism online. But not as much as all the ads back in the 90’s would make you think.